Q: What is your creative process like when coming up with ideas for dancing and photoshoots? A: For bellydance, I know right away if I like to dance to a song from the first time that I listen to it. I simply listen to the song over and over until I get used to every beat and rhythm, and plan to dance to it the next time I rent the studio. 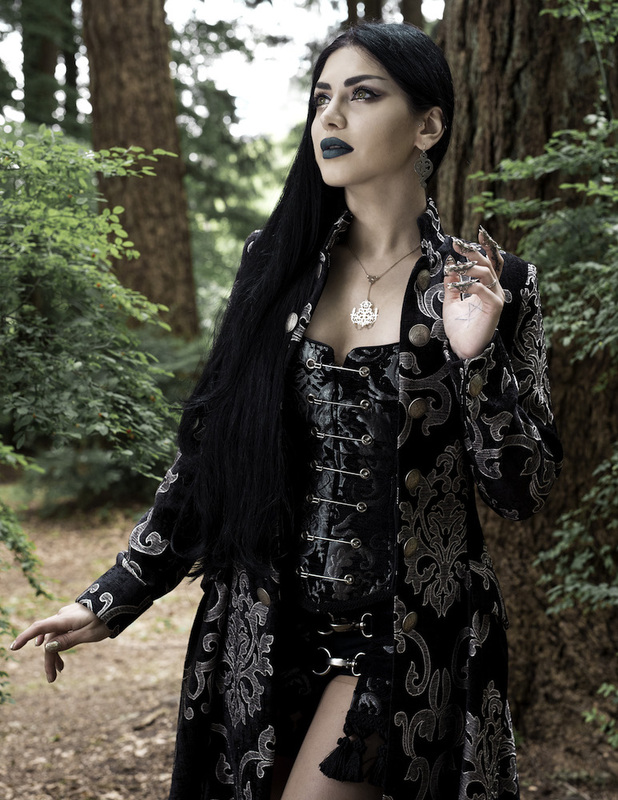 For photoshoots, I’m mainly inspired by the fantasy and vampire novels I read, specifically Anne Rice, and the paintings of artists such as Victoria Francés. I’m also extremely inspired by dark and fantasy movies. I also get inspired by the brands and designers that I work with. Especially those that create pieces that are more on the fantasy side of fashion. Q: How did you get started with modelling? A: I was doing self-portraits with basic (non-DSLR) cameras ever since I was in high school. I was doing this back in 2007, maybe even earlier. I used to play with photoshop and try to create fantasy images, although back then I knew little about photography and editing. I did it for myself only. In 2011, I did my very first photoshoot, when a photographer saw my bellydance videos and emailed me about an idea he had to do a shoot with me. 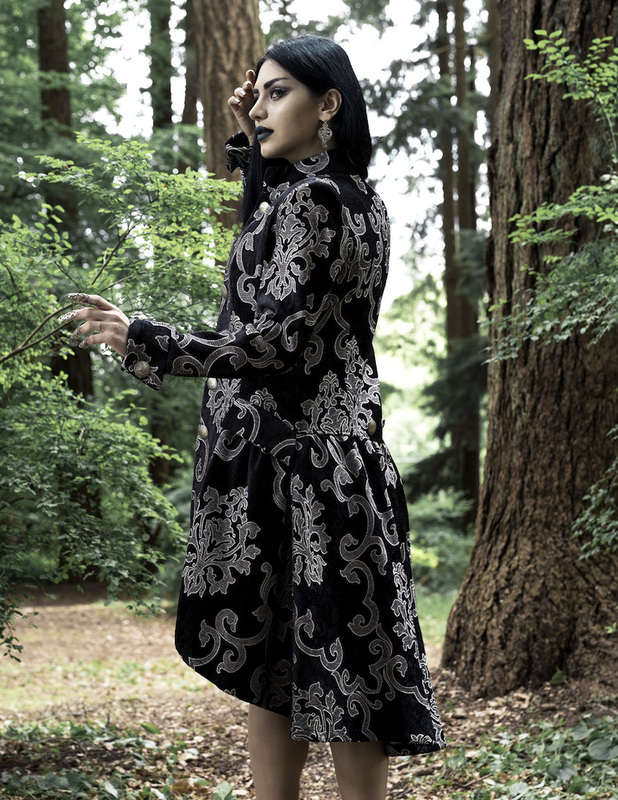 We did a fantasy, light shoot in a forest in Vancouver, and later on a bellydance theme. As a bellydancer, it was very important to me to have professional images up, since I was trying to become more and more active online. As time went by, I started loving the process of shooting and modelling, especially because I was also editing most of the images myself. Also, almost every shoot I did was my own theme. I enjoyed putting together different looks, stories and ideas. Later on I purchased my first DSLR and started doing better self-portraits and learning to edit properly. Q: Who are your biggest inspirations and why? A: There are many people that inspire me in different ways. In my personal life, I am inspired by my mother. She’s strong, loving, positive and young at heart. I hope to be like her when I am her age. When it comes to art, a lot of what I do is inspired by artists like Victoria Francés, as mentioned before, who creates the most beautiful gothic paintings I have ever seen. I grew up with posters of her art on my walls, and wanted to look like her women when I got older. With the long hair, dark beauty and such. I also grew up reading Anne Rice a lot, so her world is an inspiration to me. When it comes to music, I’m inspired by the musicians and bands than I have danced to on my YouTube videos. When it comes to musicians or artists that I know personally, I’m inspired by the gentlemen in the band Moonspell. They are some of the most down-to-earth people that I have had the pleasure of knowing and working with. I can go on and on, but I’m inspired by many people. I look up to many people… and it’s easy, since I’m surrounded by some of the most talented people in the world. Q: Do you have a message you are trying to convey though your art? A: Good question! I don’t believe so. At least I don’t believe that I have one specific message to convey through my art. I say this because I believe that every single thing I do carries its own message in a way. Every dance video tells a story. Every photoshoot tells its own story. I’m simply living out my fantasy and imagination, and taking my audience on a ride with me through each thing that I create. Q: What goals do you have as an artist? A: To keep growing and evolving, and to be happy. Q: When did you discover belly dance and why were you drawn to it? 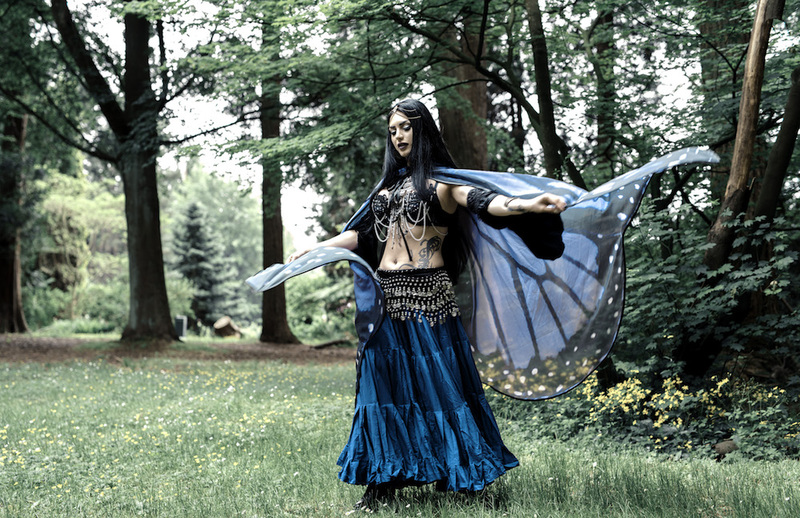 A: I fell in love with both bellydance and metal music at the same time, back in 2007. I found myself naturally moving to metal music, and thought that it would be perfect to mix them if I ever decided to do something serious as a dancer. I discovered bellydance through Ancient Egyptian spirituality. I felt drawn to it, when I learned that in the ancient times, bellydance was used as a way to worship the Gods and Goddesses. I wanted to give it a modern twist with my love for metal music. I also grew up in a family where most women danced amazingly. I grew up being too shy to join my family when we got together to dance, so I watched them move beautifully. I believe that, too, inspired me to do this today. Q: Are there any artists you would like to work with? A: Absolutely! It’s a dream of mine to one day perform with Nightwish, Within Temptation, Devin Townsend and many other bands that I love and can imagine dancing with. Q: How have your life experiences shaped your art? A: I believe that most of the pain I endured in life gives a special “beauty” to some of the things that I do, especially some of my dance routines. Now that I look back at a few of my own videos, I can see where that certain emotion came from, for example. I like to use pain to create beautiful art, rather than let it simply consume me. Often, when I feel down, I sit behind the piano and put something together. Or edit that one photo which I always thought would look great with a “darker touch”. Q: When did you know you were an artist? Did you embrace it? A: Ever since I was little, I had a dream to do something artistic in life. For the longest time, up until the age of 14 or so, I wanted to be an actress. I even took theatre acting for a few years, and took it very seriously. I always wanted to have an artistic way to escape and express myself. I don’t think that there was a specific moment when I realized “alright, now I’m considered an artist”, because everything moved very slowly and steadily with Mahafsoun. I first uploaded a YouTube video playing the piano, and later on uploaded a bellydance video. Then, I created a Facebook page and noticed that a lot of people were finding it, liking it and supporting what I had started. Motivating me to continue. Every single day since the day that I started Mahafsoun, I have been working, and it has been growing slowly, day by day. This is good, because it never “shocked” me. Nothing happened overnight, so I feel very normal. Although recently, a lot of fantastic opportunities have been coming my way, which is making me feel like this year, a lot of the dreams I have had for many years will come to life. Q: What achievements are you most proud of? A: Finishing school and working in the laboratory of an amazing hospital in Canada. When it comes to what I do artistically, I’m simply proud to still be as in love with, and motivated about what I do as I was the first day I embraced it. Q: What qualities do you look for in a collaborator? A: To be as motivated and positive as myself. I love working with artists that are kind, motivated, humble and creative. Each collaboration is a “living thing” to me. The photos, videos or artwork we end up creating embody their own energies, and their own memories. It’s very important to me that those memories are positive ones. Q: How would you best describe your personal style? A: I would simply call it “alternative”, because it’s hard for me to label it as something specific. I love classic Victorian gothic, nu goth, fantasy, and more. I even find myself wearing a sporty ensemble every now and then, with a touch of something alternative in the outfit. A: I find inspiration in music, movies, books, paintings, strong emotions (both positive and negative ones), nature and more. And of course, I find inspiration in the people that follow what I do, as they’ve been the ones motivating me and inspiring me to continue Mahafsoun for all these years. Q: Do you consider yourself Goth? When did you embrace alternative culture and what about it attracted you? A: Yes and no. 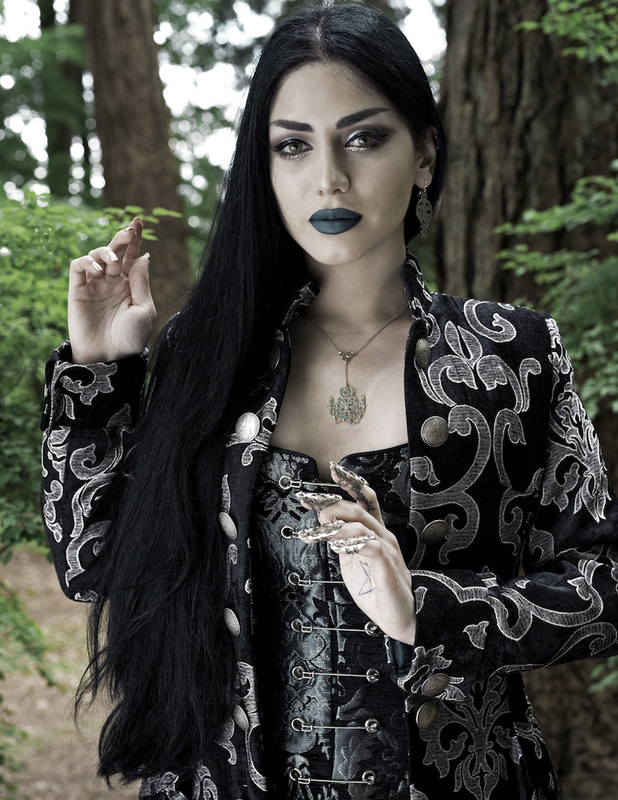 I embrace the gothic fashion and subculture, but I know so many people that are “perfectly gothic”, to the point where I see myself and cannot see the same level of dedication to the gothic subculture. This is why I would call myself simply “alternative”. Q: When you aren’t modelling, dancing or busy working in the laboratory, what are some of your favourite things to do in your spare time? A: I love to watch shows on Netflix, browse YouTube, reply to emails, edit my photoshoots and videos, and waste time browsing 9GAG. Recently I started creating crowns made with quartz crystals. I also spend my semi-free time with my family and few close friends. Although to be honest, for the longest time, I truly have not felt like I have “free time”. I’m always doing something that would be considered work. One of my goals for the rest of this year is to truly take some time off and enjoy doing absolutely nothing. Thank you for this wonderful interview!